This Smooth Jazz musical marriage was made in heaven; the smoothest of trumpeters Rick Braun and the even smoother Boney James make ‘Shake It Up’ such a joy. ‘RSVP opens the album in mainstream Smooth Jazz with its appealing groove and ultra strong melody. The Hugh Masekela classic ‘Grazin In The Grass’ suits the smooth format and was/is very popular. Strangely the other cover on the album works better still. Horace Silver’s ‘Song For My Father’ might not seem an obvious choice, but it works. In fact it is sublime. ‘Central Avenue’, the boys astound with what is almost the complete Smooth Jazz experience. Everything about this song oozes class. Fourplay join the party on the pleasing ‘Love’s Like That’. The programmed bassline of ‘Chain Reaction is a killer and the horn lines. Wow! 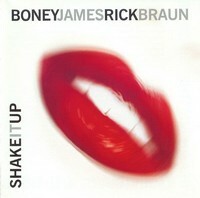 ‘Shake It Up’ remains one of mine and (many others’) favourite Smooth Jazz sets, props to Mr Rick Braun and Mr Boney James!